Hyundai is feverishly testing the Styx sub-4 meter compact SUV, which will be launched in India during May-June 2019. 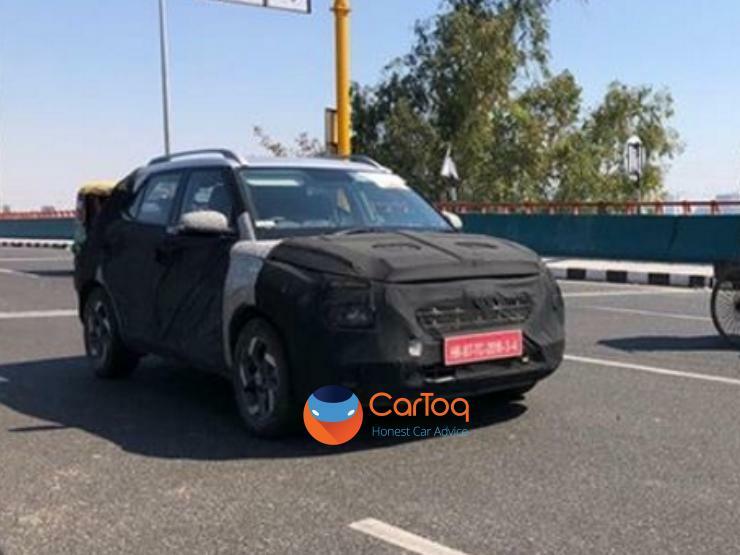 The SUV looks like a baby Creta from the spyshots, and is likely to have many design elements similar to what’s on offer in the Creta. The Styx’s official unveiling is likely to happen in a few weeks from now, at the New York International Auto Show scheduled to happen April. Here are some spyshots of the upcoming SUV from the roads of Delhi. Hat tip to CarToq reader Vidit Arora and Manu Raj Sharma. The Styx – a much smaller SUV than the Creta – will sit below the latter in terms of price and positioning. A sub-Rs. 8 lakh starting price tag is likely for the petrol powered model while the diesel engined version is expected to be priced between Rs. 8-9 lakhs. The Styx will rival the likes of the Maruti Brezza, Ford EcoSport, Tata Nexon and the recently launched Mahindra XUV300. With the Styx, Hyundai will be hoping to match or outdo Creta sales numbers, and take the fight right up to Maruti Suzuki. The Styx will have many firsts for Hyundai. It will be the first car from the South Korean automaker to be sold with a turbo petrol engine in the Indian market. Hyundai has developed a 1 liter-3 cylinder turbocharged petrol engine that will first be offered on the Styx, before being offered on other Hyundai small cars. The turbo petrol engine is expected to put out about 118 Bhp of peak power and 170 Nm of peak torque. A 6 speed manual gearbox is likely, along with a 6 speed AMT offered as an option. Another new engine that could debut on the Styx is the 1.5 liter-4 cylinder diesel engine that Hyundai has developed to meet the upcoming Bharat Stage 6 (BS6) emission norms. The diesel motor is likely to put out 115 Bhp-250 Nm, putting it among the more powerful diesel engines on offer in the compact SUV segment. Like the petrol motor, the diesel is expected to get 6 speed manual and AMT options. The compact SUV will not be offered with an all wheel drive layout, which means that a front wheel drive layout will be standard across trims. The Styx will be a typical Hyundai when it comes to features. In other words, it’s expected to be feature packed. From a touchscreen infotainment interface with Android Auto and Apple CarPlay to airbags, ABS and many more safety features, the Styx could be positioned as a segment leader in terms of features. Hyundai may take this approach to win more buyers for the SUV and make it more attractive as it’s pretty late to the segment. Watch this space for more details on this SUV.